Take a historic walk through the famed New Orleans Garden District and Lafayette Cemetery. This stroll through splendid live oak tree lined streets will bring you up close to the plentiful historic mansions in this upriver section of town. Dive deep into the history of the Garden District as you walksplore an area completely different from the French Quarter. This area has the largest collection of antebellum mansions in one location anywhere in America! This residential area is dotted with the homes of noted New Orleanians as well as world famous celebrities. You will also see numerous well-known Hollywood movie locations. Walk into the Lafayette Cemetery and learn how and why the dead are buried above ground! The walking tour begins on the famed Mardi Gras route at St. Charles Avenue and Josephine Street - at the streetcar stop! The two-hour walk with a local historian begins at the St. Charles Avenue streetcar stop at St. Charles and Josephine. You will delve deep into New Orleans history as your guide explains how this section of New Orleans was one of the first ever deliberate attempts in America to create a suburb separated from the main city. Your guide will tell the 300 year old story of New Orleans from its origins as a French city, then a bustling American port city that created the wealth that built the Garden District homes. This historian led tour will explain the growth of the city up the river to the Garden District and beyond. The tour will include a short tour of the Lafayette Cemetery, one of the most noted and Hollywood favored above ground cemeteries in New Orleans. 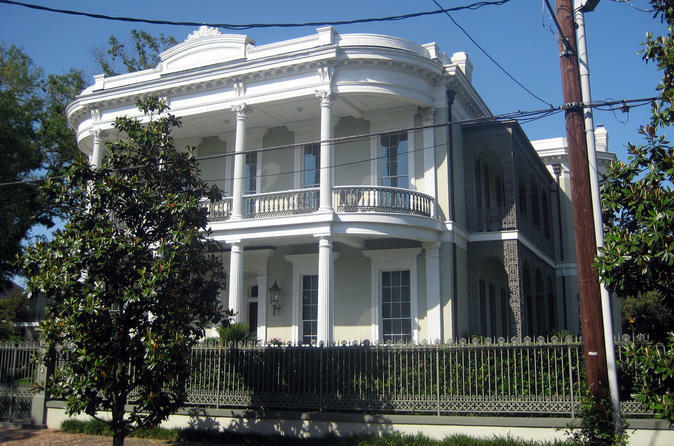 During the tour you will also see several celebrity homes, Hollywood movie location sites, learn about Commanders Palace, Ferret’s Folly, the Witching Hour home, the Coven Mansion, St. Charles Avenue (famed streetcar and Mardi Gras parade route) and the magnificent gardens that surround many of the homes. You’ll even learn about how part of the Eiffel Tower ended up in the Garden District! Discover the story of the surrounding neighborhoods like the Irish Channel where thousands of European immigrants settled.